I picked up Skip Beat, because it is a massively popular series. The first volume was interesting, but didn't establish itself in my mind as anything spectacular. However, it has piqued my interest enough that I want to continue with the series. I assume it becomes more interesting. Kyoko starts out as your stereotypical shoujo manga girl. Quiet, kind, sacrificing. She dropped everything - including school - to run off to Tokyo with childhood friend Sho to help him on his path to stardom. Once Sho becomes popular, he drops boring Kyoko like a hot potato. Here is where the book diverges from standard shoujo. Kyoko has a dark nature. Hell hath no fury like a woman scorned. She decides to join Sho in the show business industry - to show that she's just as good as he is. The ultimate message of this volume is that revenge may be a good motivation to start, but you can't succeed by only having a negative attitude. Thankfully, I don't think that this is going to turn into a happy happy series. Kyoko may learn to balance her personality, but I'm guessing she'll always have a fun edge to her. I can't really get an opinion on this volume because I'm not invested in the characters yet. I like Kyoko. I'm guessing that I'm supposed to be interested in Sho and Ren (Sho's pop star competitor), but I didn't get a feel for their personalities. I wish she'd done a better job introducing them. If I hadn't heard so many good things about this series, I don't know that the first volume would have been enough to keep me invested. The only other odd thing is that both Ren and Sho have very long legs. I guess this shows that they're tall, but they look slightly out of proportion. All in all, this volume is just okay but I'm going to keep going in this series. Hopefully I'll figure out why it's so great soon. Great review and thanks so much for reviewing this series! I haven't had a chance to read this one yet but have added to my TBR list! I heard many good reviews about this series too and about the anime. I might read it some day, but right now I have a very long TBR list. I wish that I could do shorter manga reviews like you, because mine end up being too long. 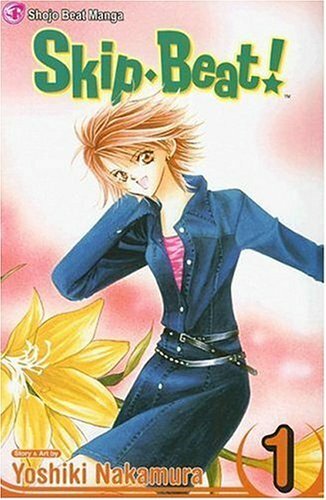 I like Skip Beat a lot - I think it actually gets weirder the further along in the series goes, but it's definitely a 'different' kind of manga. Yes, Alison, it gets SO much better! Trust me on this. Wait until you get to Volume 13, if you even CAN get it. That volume is so popular and out-of-print, it sells for $80 a book. Unless it's getting printed again, but I don't know. But, it's because it's gets so freaking amazing-good! But, like a lot of manga, you need to give it time to open up to you. The Japanese are shy, mysterious people by nature, and so is their manga. Give it time and you'll be so happy you did, with this one, anyway. I have heard so many good things about, but maybe I'm thinking of the anime and not the manga. Sorry you didn't connect but from the comments it sounds like it gets way better. I'm really interested now. Especially if there are volumes going for $80 a pop. It must be awesome! Can't wait for next week if it's volume 2!! If you like it better, I might start this series. I like a girl with an edge and seeking revenge!